Thanksgiving would not be complete without a recipe from my good friend Callie (pastry chef for Frank Stitt’s 4 phenomenal restaurants in Birmingham, Alabama)…or without sweet potato casserole! Enjoy & Happy Thanksgiving y’all! Call me crazy, but the one dish I look forward to at the Thanksgiving table is not the turkey or the dressing – it’s sweet potato casserole, or really, sweet potatoes in any form. My mom’s Marsala cranberry sauce comes in a close second, but for me, it is always hard to beat sweet potatoes, especially when paired with butter, brown sugar and cinnamon. 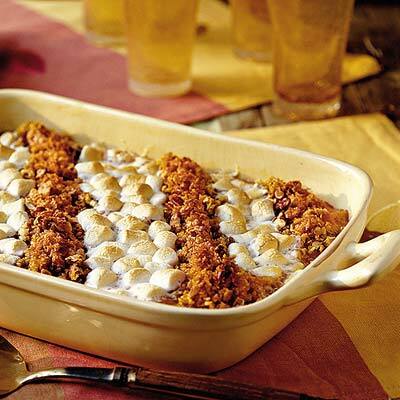 Growing up, we always had to split our casserole down the middle: one side was topped with a cinnamon-pecan crumble to suit the adults, and the remainder was concealed by puffed, golden marshmallows for the kids (and my nut allergic grandfather). For authentic Southern fare, I always turn to Edna Lewis and Scott Peacock’s The Gift of Southern Cooking, and their sweet potato casserole is delicious. Peacock writes, “To Yankees it may seem more like a dessert, but the sweetness is a good foil to a salty ham or a pork roast, and the dish is traditional at the holiday table.” And for those very reasons, this casserole has earned its place at our Thanksgiving celebration. Wash the sweet potatoes and place them on a foil-lined baking sheet. Bake for 1-1 ½ hours or until they are very tender. Remove from the oven and cool briefly, then peel. Put the peeled sweet potatoes in the large bowl of an electric mixer fitted with the whisk attachment and mix on low speed to begin mashing them. Add the butter and beat until it is absorbed. Add the salt, nutmeg, honey, and both sugars and mix until well blended. Add the eggs and vanilla and beat on medium speed for 2 minutes. Reduce mixer speed to low and slowly add the heated milk and mix until incorporated. Pour the mixture into a greased 13x9x2 inch baking dish. For the topping, combine the brown sugar, flour, cinnamon, nutmeg and salt in a mixing bowl. Use your fingers to work the chilled butter into the mixture until it resembles oatmeal with some pea-sized pieces of butter remaining. Stir in the pecans. Sprinkle the mixture evenly over the top of the sweet potatoes and bake for 30-45 minutes until the topping is golden brown and the sweet potatoes are set but still loose in the center.